If you are moving from Cisco Unified Communications attendant console and need an attendant console designed from the ground up for Skype for Business & Microsoft Lync unified communications scenarios, Attendant Pro for Skype for Business (Lync) by Landis Technologies. Attendant Pro provides very optimized Voice call handling while still providing access to all unified communication features of Skype for Business since the Skype for Business client seamlessly runs simultaneously. Microsoft is driving not only unified communications, but universal communications. Attendant Pro provides functionality to bridge the way from traditional PBX mindset the whole way to universal communications. 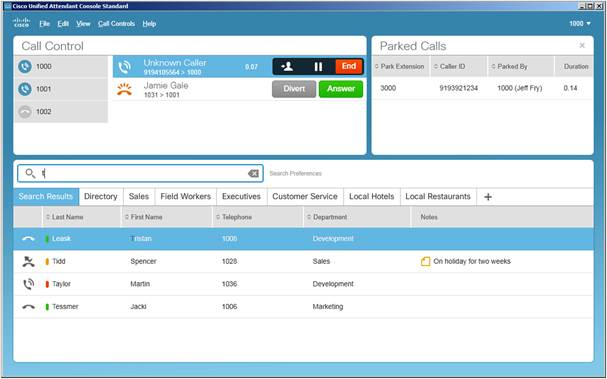 Attendant Pro provides the features you had in Cisco UC Manager Attendant Console while bringing new features to bridge from the Cisco world to the Skype for Business and Lync solution. If you would like to get a free 30 Day fully working Trial of Attendant Pro for Skype for Business for your switchboard operator to use in a live Skype for Business (Lync 2013) environment. It installs in a minute to boot!